Rotations are probably quite familiar to everyone. You can just grab an object and move it around, you can spin something on a stick, the wheels of a bike or merry-go-rounds are rotating. Everyone learns to recognize things regardless of how rotated they are since early childhood. We understand rotations intuitively and we know what to expect of them. Nevertheless, in order to understand the similarities and differences between rotations and Lorentz transformations in more depth, we have to take a look at rotations on a slightly more abstract, mathematical level. Actually, what are transformations, whether in space or in space-time? Well, simply put, a transformation is something that can take a point, let's call it A, and it will give us another point, let's call it A'. If we are on a plane, we can describe a given point for example with a pair of coordinates (x,y) - a transformation will change it into some (x', y'). 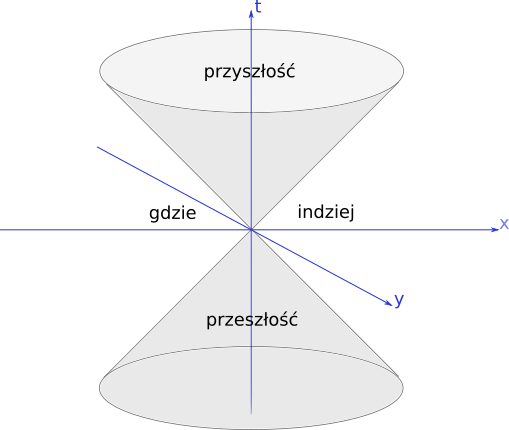 In space-time we would usually describe a point with a set of four coordinates: (t, x, y, z), and this will become (t', x', y', z') after a transformation. The distance of a point from the origin is the same before and after the rotation: (I recommend calculating this yourself from the equations above as an excercise - you just need to remember the Pythagorean trigonometric identity: ). The Pythagorean theorem tells us that the distance of a point (x,y) from the origin (0,0) is . The value in the square root doesn't change under a rotation, so the point after the transformation will be at the same distance from (0,0). To expand on the previous point somewhat - if we have two points A and B, whose coordinates differ by and , and we transform them into A' and B', whose coordinates will differ by . The second bullet point above also means that rotations transform circles centered at (0,0) into themselves - however you rotate a circle, it looks the same. A circle is a set of points at a given distance from the center - so if we have a point on a circle, at a given distance from the center, it will be at the same distance from the center after the rotation, so also on the same circle. You can actually see that in the animation above. Why am I writing about all this? It should become clear in a moment - when we start talking about Lorentz transformations. The Lorentz transformations aren't as intuitive to people as rotations. In a sense, we also deal with them since childhood (they are the transformations describing the relationships between moving observers, after all), but it's definitely much less visible. Full Lorentz tranformations work in a 4-dimensional space-time, but just like in the previous article, we will limit ourselves to two dimensions for simplicity - the dimensions being time and one spatial dimension. Such a 2-dimensional space-time is very similar to a plane, and you can also describe the points in it with two coordinates - but we will be using (t,x) instead of (x,y). is for now (it has something to do with the velocity of the observer), right now we will focus on the similarities with rotations. And there are a lot of similarities, indeed! Like in rotations, sines and cosines appear - except hyperbolic, not "regular" (you can read more about hyperbolic functions here). Also like with rotations, the point (0,0) is transformed into (0,0) - the transformation doesn't touch it. And again like in rotation, there is a value associated with every point that the transformation doesn't change. Let us remind ourselves: rotations didn't change the distance of points from the origin, nor, what follows, the square of the distance, equal to . According to the hint for the calculations, it is related to the Pythagorean trigonometric identity, which is the fact that for any angle , the equality holds. Well, there is actually a hyperbolic identity as well: for any , the equality holds. And also because of that identity, the Lorentz transformations don't change the value (or, if we want to measure time and distance in different units: - the equations written above simply assume ). This value is called the space-time interval. Just like in rotations, not only the interval between a point and the origin is conserved, but also between any two points: . As it turns out, the space-time interval has many properties not unlike those of distance. The main difference is that the square of the distance between two different points is always positive - the interval, on the other hand, can be either positive, negative or even zero. Since it is conserved, any points separated by a positive interval will also be separated with a positive interval after the transformation - and the same holds for negative and zero intervals. What does it mean? Let us remember that points in space-time are events. The event A happened in the place and time , and event B happened in place and time . is thus the distance between events A and B, and is the time that passed since A until B, or the other way round. Dividing the distance by the time we get the speed we would need to move at in order to cover this distance in this time - so in order to get from A to B, you have to move at - the speed of light. And now the most important thing - the Lorentz transformations don't change the interval! This means that if we look from the point of view of a different observer - which corresponds to transforming A and B into A' and B' with a Lorentz transformation - the interval between A' and B' will also be zero! This means that if something moves at the speed of light in one frame of reference, it will be moving at the speed of light in all frames of reference. This is the famous invariance of the speed of light. Let us take another look at the animated picture above. You can see two dark-yellow-brownish, oblique lines. These are the lines that correspond to moving at the speed of light. You can see that they are staying in place regardless of how the picture is transformed. A similar thing applies to the cyan hyperbolas. Just as rotations don't affect circles, because they are the sets of points at a constant distance from the origin, the Lorentz transformations don't affect hyperbolas - the sets of points at a constant interval from the origin. I'll refrain from going into the details of the analysis, but just like the lines correspond to a zero interval from the origin, the top and bottom hyperbolas correspond to positive intervals, and the left and right hyperbolas - to negative intervals. All in all, we can look at our space-time as divided into four quadrants with the light lines - all points in the upper and lower quadrant are separated by a positive interval from the origin, and all points in the left and right quadrants - by a negative interval. Since the Lorentz transformations don't change the interval, no point from either quadrant can ever be transformed into a point in another one! This limitation becomes slightly weaker, though, if we add some spatial dimensions. Adding a second spatial dimension, which we can imagine as rotating the picture around the time axis (the vertical one), will change the light lines into a light cone and will divide the space-time into three regions instead of four quadrants. These three regions are: the upper part of the cone - the future; the lower part of the cone - the past; and everything to the sides - so-called "elsewhere" - these are the events that can't be reached from the origin by moving at subluminal speeds. One could ask - why the futue is not just the upper half of the diagram, and the past - the lower half? After all, the points in the upper half all have time coordinates greater than zero, and the lower half - below zero... It's a very good question. Let us take another look at the animation, and specifically at what happens to the points in the left and right quadrants. The animation shows the points being transformed one way and the other way, in alternating cycles. As the transformation distorts the picture, pretty much every point in the left and right quadrants sometimes gets to the upper half, and sometimes to the lower. This means that a point with a negative time coordinate can get transformed into a point with a positive one, and vice versa - so it can get "moved" from the future into the past, or the other way round! It cannot be said then, that any of these points is in the future or in the past - it depends on the observer! This only applies to the points from "elsewhere", though - the points from the upper quadrant (the upper part of the cone) are in the future of all observers, and the points in the lower quadrant (lower part of the cone) - in the past of all observers (careful, though: of all observers that are at (0,0) - the observers in other points have their own cones, slightly shifted relative to this one). I've said a lot about the Lorentz transformations so far, but nothing about how we know that they in fact govern our reality. Well - as you can expect, we have reasons to think that. It's not as if someone just came up with the idea and everyone just took it at their word. The problem is, it is pretty complicated to show where the transformations come from. To be more precise - it's quite easy to derive Lorentz transformations once you assume that the speed of light is independent from the observer. This is how it was done in high school when I was a student (although I have no idea if it is still done this way, nor if it's even still a part of the school curriculum...). There are some further complications if we don't want to just believe that (even though the fact that the speed of light is constant is rather well documented) - some more effort is required then, but it is still possible; you can read more about it here. That's all for this part. I'm still not sure what the next one will be about. The long-term plan was to move slowly towards explaining black holes and effects related to them, so the next post will probably be about curvature. Another possibility is a slightly deeper dive into Special Relativity - like analysing the twin paradox, for example. If you have some other topic you would like to see covered - leave a comment, and I'll be sure to consider it. Any comments about the clarity of the text will also be appreciated! I'll gladly get to know what is not clear and improve it - I'd like the articles to be as easy to understand as possible.